To work with the absence of company members. Does collectivity exist in an ever changing structure? We have hopes for the future of the company and we have many questions; we speculate about the future of Weld Company and ‘The Dance Company’ in general. We are two clusters merging with new members freely oscillating between them. The boundaries between Weld Co 13 and 14 dissolving as we meet in various constellations. In 2013 when I spent nearly 3 months in this structure through working with the invited choreographers the relationships with the other dancers were forged by this work. Through the work we related in a certain way with a certain body. These bodies are absent or have changed and ways of connecting are re-negotiated and bodies are re- again. By choosing to do or not do things identities change course or shape or manifest in a different way. Shape-changing the identity of Weld Company. The company as company. A transmission machine. What is our identity both as a group and as individuals? 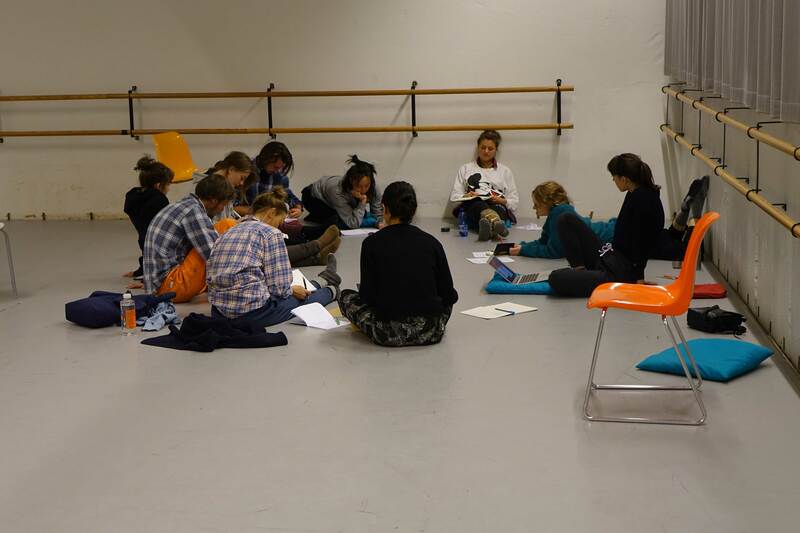 Is the work performing us or are we performing the work or is the group performing the choreographer? Movement material that is bounced back and forth between dancers and choreographer in a fluid state until decided to allow it to gel in the shape it has at that particular moment. Still unperceptibly changing by performing it again and again. If it reaches a tipping point, it can morph into something quite different from where it started. Then the question comes whether it will be allowed to exist there where it landed or whether the process of bouncing back and forth has to start anew. This quotation, taken from the personal narrative of postmodern writer and artist Theresa Hak Kyung Cha, underscores two interconnected ideas that One Events reflects upon: (dis)location and (dis)locution. In this series of questions presented as statements, Cha prompts her readers to see with her that perhaps there is no answer to what we have seen, that there is no finality. Underlined in titling her work Dictee, Cha’s quotation raises questions of dictation and authorship, of place and placelessness, ultimately pointing her readers to reflect upon whether if in any speech or action there are two selves or voices, if one is the voice of another, and if so, who this other is. One Events, the final presentation of Ayse Orhon, Christina Ciupke, and Litó Walkey for the Master in Choreography from the Amsterdam Theater School, engages with these questions both collectively and individually, that is, both on the level of the event, which juxtaposed the three individual pieces, and on the level of the relationship between the performer and the audience. As the evening unfolded, the structure of the event became more clear, but the separation between the performer and audience became further blurred. In each piece, the participation and interaction of the audience with the performer and with the work itself was revealed as a key component in what the pieces aimed to communicate. Interrelated to the level of the event, the way in which the audience’s participation with the artists and the works grew as the evening progressed. Though each artist and work encouraged different revelations of (dis)location and (dis)locution, taken together, the works encouraged a multifaceted experience of these concepts so central to the works of these artists and to their collective expression. […]Litó created a sense of timelessness and placelessness in her work; we were left wondering when the piece would start and where it would take place. However, without fully realizing it, we were already active participants in the work, engaged with Litó’s questioning the boundaries between performer and spectator, beginning and end; we were awaiting something that in fact had already begun. 1Theresa Hak Kyung Cha, Dictee (Berkeley, CA: Third Woman Press, 1995), 125. A property, commonly shortened to prop (plural: props), is an object used on stage or on screen by actors during a performance or screen production. In practical terms, a prop is considered to be anything movable or portable on a stage or a set, distinct from the actors, scenery, costumes and electrical equipment. During the Renaissance in Europe, small acting troupes functioned as cooperatives, pooling resources and dividing any income. Many performers provided their own costumes, but special items—stage weapons, furniture or other hand-held devices—were considered “company property;” hence the term “property.” The relationship between “property” in the sense of ownership and “property” in the sense of a stage or screen object imply that they “belong” to whoever uses them on stage. Episode 1670s, “commentary between two choric songs in a Greek tragedy,” also “an incidental narrative or digression within a story, poem, etc.,” from Fr. épisode or directly from Gk. epeisodion “addition,” originally neut. of epeisodios “coming in besides,” from epi “in addition” (see epi-) + eisodos “a coming in, entrance” (from eis “into” + hodos “way”). Sense of “outstanding incident, experience” first recorded in English 1773. Prosody (Phonetics) – use of pitch, tempo, rhythm in speech to convey information about the structure and meaning of an utterance. (Literary studies) – theory and principles of versification, especially as they refer to rhythm, accent and stanza – study of versification, esp. systematic study of metrical structure. The rhythmic and intonational aspect of language song sung to instrumental music pros- in addition oide – song, the study of the metrical study of a particular system of versification (metrical composition of a poem). Palimpsest writing material (as parchment or tablet) used one or more times after earlier writing has been erased. Something having usually diverse layers or aspects apparent beneath the surface. After the words stopped their dances, some other noise, not exactly poetry, not exactly music, filled the air. It was a kind of clawing sound: as if the words themselves were shimmying up a brick vine-covered edifice whose structure the people sensed but could not see. Roland Barthes book Image Music Text, and in it the essay “The Third Meaning”. Starts at page 52. The novel The Flame Alphabet by Ben Marcus. This is the beginning of it.